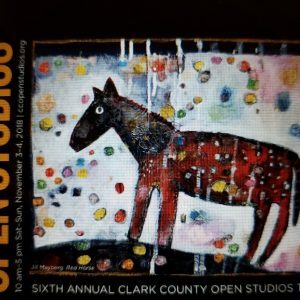 Saturday Novemeber 3rd and Sunday November 4th, my studio #22, will be open as part of the Clark County Open Studio Tour. 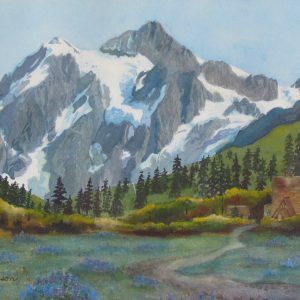 Please stop by to see what is new and to sign up for my free ART DEPART GIVEAWAY. Dear Collectors and Friends, I have a finally found my password so I could get into my website and update it. How unorganized of me to loose it for almost a whole year. Well, there is always a good excuse. My grandkids ages 7 and 3 were here painting with me for almost 4 months this year. Yes, I painted and had tons of fun, but they took precedent over everything else in my creative life. They left for a short time and returned again. This has been a great grandma year. Now it is serious paint time for the gallery and open studio tour. Mt. Schucksan has already sold at ART ON THE BOULEVARD! Thank you Kevin. 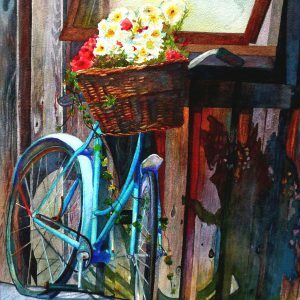 All of the artists juried into CCOS tour will have one representational piece of art at the CAVE gallery on the first Friday in November. The Cave is located at 108 E Evergreen Blvd in Vancouver WA. Art Walk will be from 5 to 8 PM. This show will continue through the month of November. All the art is for sale. My piece, HAND ME DOWN’S will be on display. Hope to see you there at the art walk..